Cheese choices for Christmas, Christmas Puddings, Christmas drinks, fruit cakes, chutneys, pickles and table sauces. Bread and in-store bakery and why you should sell bottled beer. 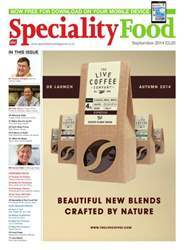 The American artisan cheese industry, and an extensive preview of this month's Speciality and Fine Food Fair at Olympia. Ten rules for farm shop success. Visit delis and farm shops at Tenby, Woodbridge and Elder St, Essex. East Anglian Focus includes meat, fish, fruit and drinks. All the latest fine food and dairy news and views, plus the latest opinions of Bruce Langlands of Harrods, The Cheeseweb's Juliet Harbutt, Justin Tunstall and Giles Henshel.